The Air Eraser is a precision tool, similar to a small sand blaster, used when accurate material control is required. For use in well ventilated area to clean, etch & remove unwanted coating materials or discolorations without marring surface. Ideal for etching decorative patterns or monograms on glass. 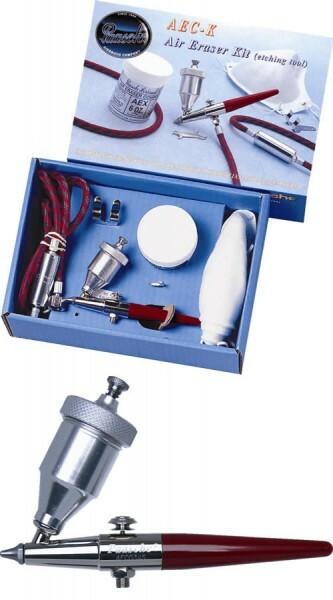 Air Eraser Kit can be used anywhere an abrasive is required to delicately erase; such as decorative etching on glass. Can also be used by the professional technician, manufacturer, hobbyist or for dental lab work, erasing color, removing rust or smooth castings.